Manhattan has plenty of bridges—they're its most recognizable landmarks, really—but exactly how many more would it need if every last person drove a car? 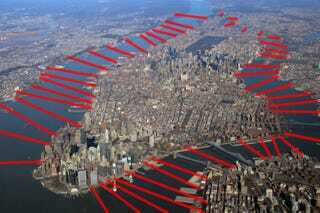 Matt Taylor, a transit engineer, has seen this bizarro-Manhattan, and it's not pretty. Taylor took it upon himself to calculate exactly how many more bridges we'd need it everyone had a car. "2,060,000 people need to enter and exit Manhattan around the same times each day," he writes in a blog post, making allowances for the tourists, students, and even hospital patients that come in and out of the city every day. Right now, he continues, just 16 percent of those people enter the island via car. This situation would be problematic because it leaves less than no time for other activities. In order to make this scenario function we will assume enough capacity is needed for all vehicles to enter Manhattan within a 4 hour AM peak period and exit within a 4 hour PM peak period. This would require 380 additional traffic lanes, a 280% increase, which could be provided by 48 new 8-lane crossings. So there you have it: 48 new bridges, each with eight lanes of traffic. And don't even get Taylor started on the parking: It would take two underground garages literally the size of Manhattan to house all those cars.